During my undergraduate years at Indiana University, my husband and I were friends with a wonderful couple who had us over many times. First in their apartment, then in their house, Sadia and I would stand by her stove as she placed a stainless steel potbelly pan over a flame. 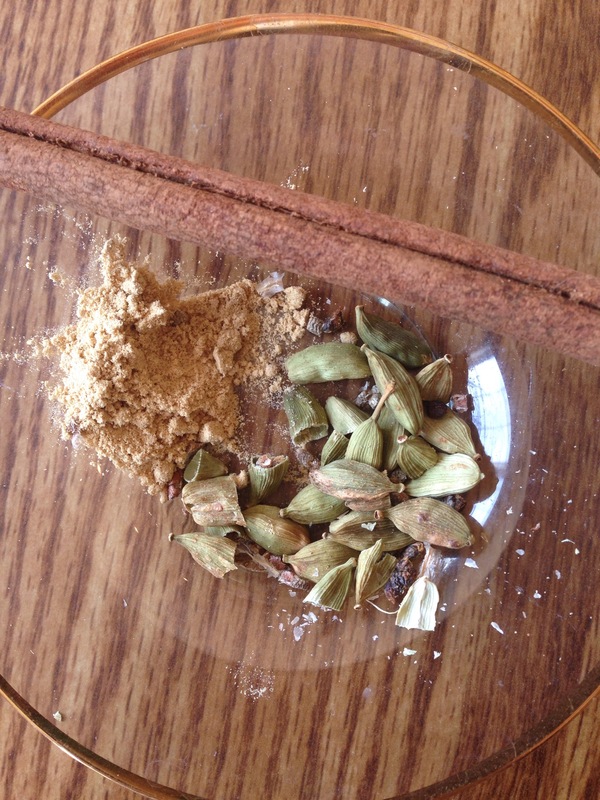 She filled it with water, then began cutting green cardamom pods in half with scissors. I watched the pods drop into the water a half at a time, their black seeds spilling out. At my own apartment, and then my own home, I repeat the motions. Nostalgia is brought on and heightened by scents, but ritual can bring me back into the moment, the place between here and now where I have brought past forward to present. Sadia was a wonderful friend. There was a meditative quality to the manner in which she brought spices and water to a boil. I felt cared for and safe with her. This is no doubt why her chai was the best chai. After she moved, I found I could not repeat the flavor of her friendship. Cutting cardamom pods became a ritual inclusion in my own chai recipe. I also began to add powdered ginger, then candied ginger. Sadia used whole milk. I switched to two percent, then omitted milk altogether, choosing soy milk, then almond milk, then no sugar. My chai has transformed with me, a constant reflection of the comfort I need in my life. Today, I drink mine with unsweetened almond milk, heavy on the cardamom and without a hint of sugar. I prefer to brew it strong, with Newman’s Own Royal Tea as my black tea of choice. What you will find below is a chai recipe from the middle of my chai-making season. I often place these ingredients dry in a ziploc bag in order to brew a fresh pot at the home of a loved one. On more than one occasion I have been known to print directions and gift this much like my mother used to gift Spice Tea to our friends and family every Christmas. I hope this recipe will encourage you to explore chai, and that you will chime in with your individual or ethnic tailoring. Place first set of ingredients in a saucepan and bring to a boil on high heat. Remove from heat. Add tea bags and return to a boil. (Adding tea bags on heat can cause the pot to froth over.) Remove from heat. Turn heat to medium-low. Stir in milk and return to medium-low heat. Bring just to a boil, stirring constantly to prevent burning the milk. Remove from heat and taste. You will probably want another 1/4 cup sugar at this point if you like a very sweet chai. Serve hot or iced.